Today we’re going all out with the fancification you can add to the hem of a simple skirt (or a pillowcase, a hankie, a tea towel – anything with a hem really). Today I bring you my favorite fancy schmancy embellishment – the crocheted scallop edge. Here’s what it looks like. I happen to think this elevates a simple T-shirt skirt into something really nice. That simple band of color around the bottom, the addition of a different texture – it just works. And it works for grown up clothes too! You can click on any of the images to see them even bigger. I don’t care if you’ve never picked up a crochet hook before – you can totally do this! The video is longish – not because it’s extra complicated, but because I take you slowly through every step. AND I’ve also made up a printable PDF with a kajillion step by step photos that you can keep near you on the sofa while you work. You can download that here. I tell you what needle size to use and I even took photos of the label of the yarn I use so you can see all the details. You can do this! This is the last of this batch of skirt fancification videos. Here’s a rundown of the other posts. Thanks so much for all these helpful videos and for the pdf’s, too! 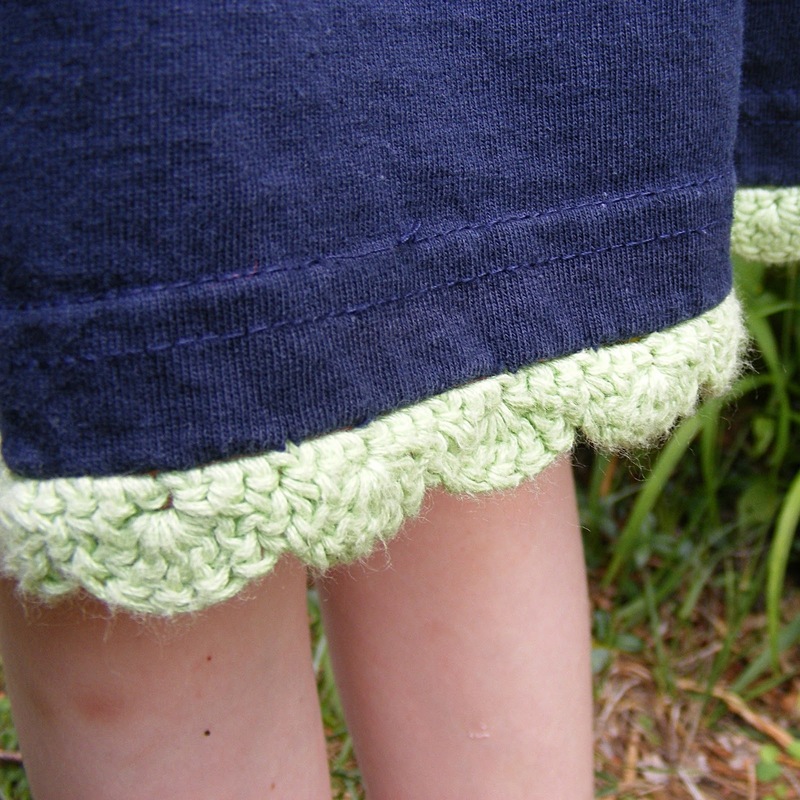 The scallop edging is a terrific one for using on so many projects. Maybe I’ll try this crochet stuff again. Too cute! Thanks for the excellent tutorial! Very clearly laid out. Very sweet on that skirt, and would also finish off a doll’s dress very nicely. Oooh! I’ll have to do that for one of the Dress Up Bunch dolls!